Witzend Studio has a good sized live room and plenty of space to set up. 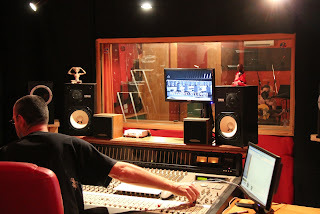 The studio is equipped with an automated mixing console and a full range of rack equipment. Recording is via a 2 x TASCAM 24 track digital hard disk recorders, with a 16 track analogue recorder available. All recorders can be synchronised together if required. If you like to work at home but have problems tracking, for example, Drums, Guitars, Bass or Vocals, these can be tracked at Witzend and the recordings supplied to you in your required file format. There is also a good selection of software on hand for both recording and midi Sequencing. For cash strapped bands, Witzend Studio’s has the ability to record a live in the studio demo. The band plays live in the studio as they would in a rehearsal room with no overdubs, the live recording is then mixed and mastered. The demo is then burnt to CD. This method of recording takes far less time than a full multitrack recording and although there are some limitations, a good demo of what the band really sounds like is the result. Another service Witzend Studio’s can offer is the transfer of most older formats to CD/Digital or MP3, i.e. Cassette tape, 1/4” tape, DAT tape & Vinyl, and cleaning up and re-mastering old band recordings. Alan with his experience and expertise can help you to produce a world class recording with reasonable hourly rates and discounts for longer projects.